금강반야경은 줄여서 ‘금강경’이라고 부르기도 하는데, 조계종의 근본 경전으로 우리나라에서는 반야심경 다음으로 많이 읽히는 경전이다. 이 책은 금강경에 대해 공철(公哲)이 쉽게 풀이한 것을 나중에 지온(志온)이 보충한 것으로 ‘개현초(開玄褻)’에 관한 7권 중 권4-6이 하나의 책으로 만들어져 전해진 것이다. 닥종이에 찍은 목판본으로 크기는 세로 36㎝, 가로 35㎝이다. 고려 대각국사 의천이 중국, 요, 일본 등에서 구해온 불경을 토대로 만든 교장(敎藏)을 보고 조선 세조 7년(1461)에 간경도감에서 다시 새겨 펴낸 것이다. 각 권의 끝 부분에 글씨를 쓴 사람들과 교정을 본 사람들의 이름이 나열되어 있고, 세조 때 간경도감에서 다시 펴냈다는 기록이 있다. 따라서 이 책은 송광사에 보존된 여러 교장(敎藏)들이 고려시대의 원본이 아니고 간경도감에서 교장(敎藏)을 보고 다시 새겨 펴낸 것임을 알 수 있게 해주는 중요한 자료가 된다. 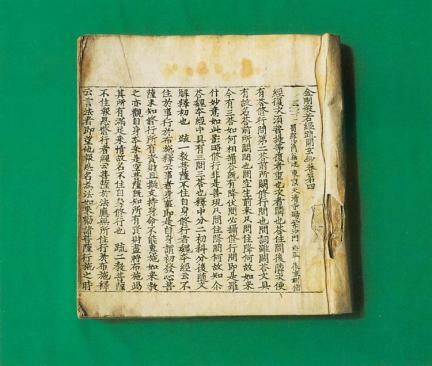 The Vajracchedika prajnaparamita Sutra, also known as the Diamond Sutra, is the basic sutra for the Jogye Order (a Korean Buddhist sect), and is the second most frequently read sutra in Korea after the Heart Sutra. The book was produced with a commentary by Jion on the edition containing Gocheol’s explanation of the Diamond Sutra. 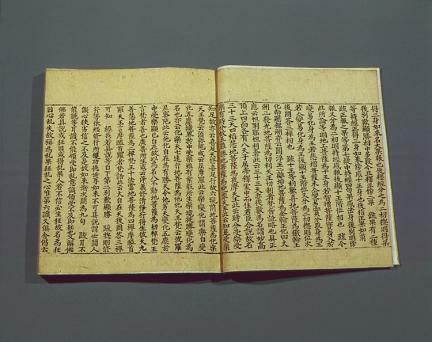 Printed on mulberry paper with dimensions of 36 cm (L) by 35 cm (W), the book consists of volumes 4 and 5 (out of seven volumes) bound into one book. Its original text was the Sokjanggyeong (Supplement to the Tripitaka), which was compiled from sutras originating from China, the Liao Dynasty, and Japan by State Preceptor Uicheon of the Goryeo Dynasty. It was reprinted by the Gangyeongdogam, a governmental office established in 1461 (the 7th year of the reign of King Sejo of the Joseon Dynasty) exclusively for the translation and publication of Buddhist texts into Korean. The writers and proofreaders are listed at the end of each volume, and it is also recorded that it was reprinted by the Gangyeongdogam. Therefore, it constitutes important evidence that other the other versions of Sokjanggyeong housed at Songgwangsa Temple were reprinted based on Sokjanggyeong printed by the Gangyeongdogam.